It has four modes to switch. Before using, please make sure is in right mode. Check the LED Indicator on Soundbar, you could know what mode it is. 2. Wired connection: If your TV was a normal TV, you could use Digital Optical Cable, Coaxial Audio Cable or 3.5mm Audio cable included in package to connect. 3. RCA to AUX connection: If your TV only has a RCA input, please use the lotus cable and 3.5mm Audio cable to transform. Before using the remote, please help to read the instructions. When using remote to control Soundbar, please ensure the sensor on the top of remote is towards to the LED Indicator of Soundbar. 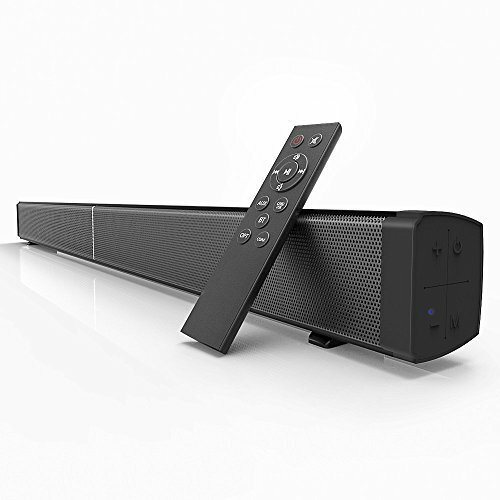 31.4-inch 40 Watt 2.0 Channel Soundbar: complements your home theatre system with 4 *10W amplified speaker drivers, wirelessly streams all your favorite music services too.--Works with any Bluetooth enable devices, such as IOS (iPhone), Android, tablets, iPad, laptop, MP3 players, etc. This built in Bluetooth technology allows you to stream music from your Bluetooth enabled device. Multi-function connection: you can stream music and nice voice from any bluetooth devices such as smartphone, computers(the effective distance wireless bluetooth:10 meters/33 feet), or wired connections that include 3.5mm Audio, RCA, Optical, Coaxial, and TF Card. You can switch mode by remote control and operate button on the soundbar. Remote control: Dual operation modes for convenience, operate button on the device or a remote control to basic settings including play/pause, volume up/down and track selection.